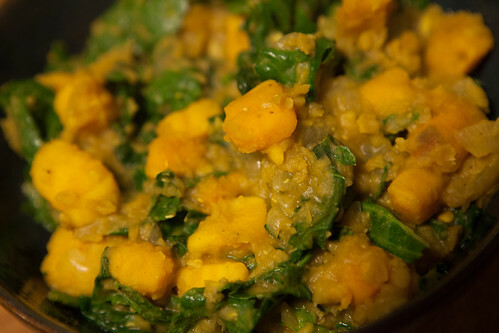 This is probably my favorite savory dish of all time: Sweet Potato Dal from Everyday Happy Herbivore. I know I posted about it in VeganMofo 2012, and two years later I'm still making it all the time. The combination of greens (I usually use kale instead of spinach in this dish), sweet potatoes, and lentils is so tasty and filling, and the garam masala spicing - which I never used before getting the Happy Herbivore cookbooks - is just perfect. Speaking of greens, we harvested over 56 pounds of chard at Alemany Farm today! I'm cooking some up tonight, with potatoes... and I have another delicious sweet potato dish which I'll blog about next week.